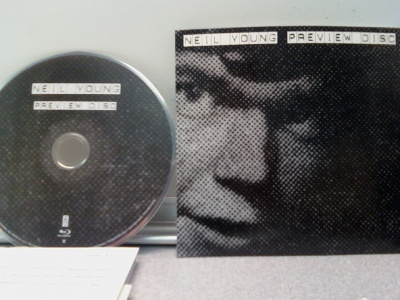 Well, as luck would have it, our Neil Young Archives preview Blu-Ray disc arrived yesterday. And in the bizarro world of a life long Neil fan who has been awaiting for this day to arrive, we hold in our hands and gaze at a shiny disc. Ain't got no Blu-Ray player. Ain't got no HD screen. Got mashed potato's but that's it. Talk about weird. Anyways, we admit we didn't exactly jump on our pre-order. Or buying a bunch of fancy new-fangled hardware. We've been Charlie Brown'd once too often. We've been wrestling with whether to go the PC route or the player route. We're hearing that the BD PC's are not ready for prime time as yet and have been advised to steer clear for the time being. We've also been weighing the Sony PS3 vs. other players. And then there's HD screens, amplifiers, speakers, memory, BD connections, cables, etc. So we would like to hear what other folks are doing regarding Blu-Ray playback if starting from scratch? Would love to hear folks specifics on makes and models, pros and cons. Any details that would be helpful to those in similar situations. I live in Germany and I just ordered a Sony BDP-350. (I pre-ordered the Archives some time ago for 240 Euros from Amazon). I really don't need HD picture so I'm not gonna buy a new TV. I'll just hook the player up to my old TV and my trusted stereo and I'll be happy! I'm in a similar boat. Unfortunately, with all the hype with BD, reality check: it's just all too much cost in this wretched economy. Box store viewing seems almost sacrileges. In the end, might end up at B#*t B*y and see what I can see. Maybe NYA2 will be different. Can we 'party like it's 1999' with dvd Archives? WHAT? You are so fired. when that comes out - it's a double headed monster! I bought a Blu-ray player (JVC XV-BP1) and hooked it up to my 36" Sony regular TV. It works fine. I used to believe (like I would suspect many others did, or still do) that you needed an HDTV to use a Blu-ray player. I was prepared to get the DVD version because I could not wait until I could pop for the widescreen. When I found out that you don't need an HDTV to use a Blu-ray player, I got one so I could get the "ultimate" Archives experience. I have not yet tried to hook it up to the internet, but will do so soon. I know it will be letterbox for now, but someday I'll get the HDTV and will be glad I have the Blu-ray version and don't have to buy it a second time. The model I got has a "zoom" feature, so if something is too small to read for my standard screen, I'll just zoom in! Tough call. To me, the biggest selling point, by far, of the archives is the fidelity of the Blu-Ray songs. We've gotten so far away from the days when we used to obsess about turntables and amps - now it's all MP3s and surround sound systems and giant flat screen TVs. I've had a number of 5.1 surround systems and never felt that they did justice to music, played as music. They're optimized for movie sound and regardless of how much I screwed around with them, I've never been happy with the result. I'm not a technician - I just want to come home and listen to good music without having to program a computer system. So, in regard to the archives, there are a bunch of decisions to make - you're not going to hear them at their best without Blu-Ray(plus you get all the interactive stuff - supposedly). So you have to start with the Blu-Ray player, making sure it has the newest software, and, really, why wouldn't you go with the PS3? For maybe $100 more, you get the game player, with all the built-ins, including Internet browser, etc., even if you don't play games. But then - what if you don't have an HD TV? Well, you have to get one. And finally, what are you going to do about your sound system? I would be very interested in hearing what people are using for optimal music playback, assuming they already have the Blu-Ray and HD TV. Neil has apparently presented us with the opportunity to spend thousands of dollars to hear the greatest Neil Young recordings ever produced. To me, it seems like maybe you either make sure you have the Blu-Ray and the HDTV and an adequate sound system, or you buy the CD version to hear the songs (and come on, it's not all that bad. Every other box set you've ever bought has been on CD and you probably didn't sit around thinking, "Gee, I wish I had this on Blu-Ray) and you wait until you can put together the whole package to buy the Blu-Rays. Please, those of you who have put together entire systems, let us know what you're using and the approximate cost of components. I suspect this discussion will still be in progress a year from now. PS3 all the way!! You can hook it up so your system can stream all your M3S, videos, etc from the computer. The PS3 has a really really great DVD upconverter too, which takes the DVD image and upconverts to HD. Plus, there are rumors that you'll soon be able to stream Netflix on it. And it has a ton of space. Really, go with the PS3! I picked up a Samsung HD TV before Xmas when all the sales were on. The package inclused a free Samsung Blue Ray Player. All I can say is that I am happy that they are both Samsung. They communicate well with each other and set-up was a breeze. If you are fortunate enough to afford a new system I suggest you get them all the same brand. I put myself in lemming mode for this and went with the ps3 so I can have blu-ray. All of the Neil camp info makes is pretty obvious that is the platform this thing was designed for. The ps-3 supports a wireless network connection, has a hard disk rather than memory sticks, and of course bdlive capability. I didn't find any of the other blu-ray players had all of that. After putting so much energy into following this for so many years, I figured I'd give myself the best chance to experience it as Neil intended. Question.Is there an affordable sound system that is 24/96khz compatable. 'Cause I'm pretty sure there's not a sound system that's 24/192khz compatable offered on the market yet. "In regard to the archives, there are a bunch of decisions to make"
"I would be very interested in hearing what people are using for optimal music playback." Samsung BD-P1500 Blu-Ray > HDMI to Yamaha RX-V663 amp (= UK model RX-V763)> Panasonic PZ80 TV and some cheap-ish but decent Swedish speakers: Dynavoice Definition + some old Tannoy speakers I use for surround. Everything works great for the few Blu-Ray discs I have. Can't wait to crank it up with the Archives! Wow, thrasher, and I thought I was a Ludditte..
A while back, I took advantage of Sony's offer for $150 off on the PS3 (the smaller one) by signing up for their credit card - brought the total cost down to $250 - and, I've been using it as my DVD player and I love it ! I already had a Samsung flatscreen, so, the picture is fantastic. I just ordered some ethernet cable which I plan to run from my router down to the PS3 in the hope that I'll be able to connect to grab any BD Live goodies that Neil throws our way. I can't wait to see if that works.. I also have a little surround sound system thing that runs through the TV/PS3, but it isn't anything like what I want. I'm thinking I'll just move everything downstairs and run it through my stereo. "Is there an affordable sound system that is 24/96khz compatable. 'Cause I'm pretty sure there's not a sound system that's 24/192khz compatable offered on the market yet." There are plenty of receivers out there with 24/192 D->A converters. I'll order the Blu-ray version (yikes, I haven't gotten around to that yet.) Anyway, I'll do that. Then I'll download the mp3's to listen to the songs. And I'll decide what to do later about my system. When my son built my desktop PC, I had him put in a blu-ray drive so I guess I can play around with them a bit but as you say, it's not really an ideal setup to have on your PC even though this computer will eventually be the mainstay-piece of my entertainment center. If you decide to go the PS3 route you might want to wait a couple of weeks. It's rumored (google PS3 price drop) that during the E3 expo (electronics industry expo June 2-4) Sony may be announcing a price drop on the PS3. Perhaps as big as $100 dropping the price to $299 for the 80GB. No guarantee but worth the wait just in case. Fingers crossed. FYI this week Amazon dropped the price on the PS3 by a measly $10. note-receiver and speakers could be replaced with powered speakers. Just bought a Sony 350 blu-ray player and will hook it up to my old analog tv and Pioneer reciever.I got the NYA on blu-ray for future upgrades. That's the only way to go. I've got a Samsung BD-P1500 going to a Sony STR-DG820 receiver via HDMI. I'm a little worried though, because ever since I've upgraded to the latest firmware on the blu-ray player, it's been having audio "hiccups" on some discs which have DTS-HD MA encoding. If I remember right, that is the format NYA is using. Hopefully everything goes well come June 2; fingers crossed! Ha Thrasher, welcome to BD-Player club! Same story over here. Had to laugh a lot after reading your introduction. And I do have the preview disc for a week or two. No spare time at the moment. Next week on the road again and after that it's all Neil. Ten discs and two shows in one week! Let's get lost. Anyway, it's great to move the discussion from Blu-Ray to sound. I do agree with Pinto completely and am very surprised that there was not any discussion about sound before. Just heard the rumour that NY himself has connected his giant Magnatone (the one he uses on stage at the moment) to his Blu-Ray player. He is watching the Archives with good sound quallity. That's why we don't hear so much from him recently. Thanks, Archives Guy, for the announcement. I still find myself holding my breath in gleeful anticipation! My brother has an Asus D70 gaming computer with HD and Blu-Ray. I've been trying to get my hands on it to see if the disc works on that. I also have a Preview Disc, but no player. As a matter of fact, I have 2 discs because Warner cancelled my order, and I had to re-order because my billing address and shipping address were not the same. I'm wondering if anybody else has had this problem. I'm still counting the days...12!!! "When the going gets tough, the tough go shopping. AG - you da man! Your info has been extremely helpfull. Your humor even moreso. Tell Ol' Neil Young -THANKS! Had the same thing over here: my billing address and shipping address were not the same according to Warner. I did send them a mail that the billing and shipping adresses are the same. Only received one preview disc. Do you think I can play the Archives Volume 1 on my Technics SL-1200MK2 in the near future? Shiiiiit!... And I was only going to buy a couple of new scalpels and a thermometer!...I think its time to get serious about my sound and picture systems to get the full "Shakin' experience. Thanks for all the confusion guys!!! Pinto (or Flounder) said of buying the Blu-ray version of NYA1: "But then - what if you don't have an HD TV? Well, you have to get one." This is not correct! As I stated earlier, you do NOT need an HDTV to play Blu-ray discs! You current TV will suffice. The only issue I can think of, again stated earlier, is that some of the things one might like to read could be a bit too small, but if you have a "Zoom" feature on your BD player, you should be able to read anything you want to read. Nothing sez I love you like buying the wife a flat screen as a belated Mother's Day gift and the husband a BD player for Father's Day. I think it's a worthwile investment to assemble a good quality home theatre system, not only for the Archives but for ALL your music DVD's and Blu-rays! I've just completed mine, and it's worth every euro (or dollar)! - Blu-ray player LG BD300 : €250, supports the new audio formats TrueHD and DTS-HD Master Audio AND has BD Live for the Archives updates! - speakers Canton CD-1000: €600, don't save money on the speakers, this is the most important part of your system! Just google these components and you'll see that this is very, very good AND affordable stuff! Looks and sounds wonderful on my LG426100 Full HD LCD! Don't forget to use 1.3 HDMI cables for best quality sound and vision. Just watched Roy Orbison's Black and White Night blu-ray, and I was blown away, really incredible! While the PS3 is a fine choice technically....I just can't get past the idea of having a power hog gamebox in the livingroom...fans whirring and all...and I've heard that some of the standalones have better sound and picture, like some of the newer panasonics. I have the following setup, purchased it all in Jan of this year. The prospect of the blu ray archives just helped to convince me that now was the time to spend on a AV system. Overall I would class this as a Good Entry level system. All connected through good quality HDMI 1.3 cables. At the moment I just have two Gayle Floor standing speakers, can't afford the full sound set, but the whole thing sounds and look amazing. Like Carlo said, spend as much as you can on speakers, it makes a difference. I have been blown away with the improvement in quality of normal TV and more importantly blu ray movies (even without full 5.1 or 7.1 sound). There is a true difference that really make the investment worth it! I've not had a problem with the preview disk, it looks and sounds awesome, can't wait to waste some days listening, watching and exploring the archives. After 3 months of doing research I went back to what Neil said the PS3 is all you need at the Java presentation.I have always trusted his instinct. The man is ten years ahead of the pack. June 2, should be a holiday. Archives Day 1. I have the Samsung BD-P1500 Blu-Ray > HDMI to Yamaha RX-V663 amp and samsung 46 inch lcd with new speakers - all recently purchased. Need to upgrade anyway as all my hifi gear was 15 yrs old and speakers were screwed . I think with the bluray player bdp1500 we may have issues getting the bd live downloads, as only supports firmware upgrades via ethernet.It supports bd live , so playing archives should be fine though, just the updates are the issue. I expect we will have to go PS3 or later model player down the track to get the content added to timelines post release. Be keen to know how you go when you get your bluray set. I'm looking to get a new 1.3 HDMI cable - can anyone recommend the best available? im getting the dvd for the clickable stuff and the book,just want to hear what i havnt heard before and dont care about the sound so much.i really am looking forward to 2 and 3.
i know ill miss out on more content but thrasher will let me know all about it im sure! Highly recommend these guys, great quality at an affordable price. Not sure if they ship internationally though? Subsonic XM2 MKII, great Australian Brand (poorly designed website though, I think they should stick to making speakers!). MARIAN M 5/21/2009 3.19pm..Had the same thing happen to me. The problem was between the addy I gave for the delivery of the disc as compared to my address listed at the bank for my credit card. My delivery address has got extra detail in it for my mailman to find us out here in the bush but the bank has only got my Mail Service Del No: listed on the statment...immediate confusion for warner. To Warner's credit I guess they were making sure that I was the correct recipient for the preview disc. An email fixed the problem immediately and I have received to date only 1 preview disc. Just make sure that because you have now received 2 discs that you don't get charged twice on your credit card!!!! I have a Panasonic BD 35 Blu Ray Player, and I am having problem with the preview disc. The problem is that everything on the disc is mind blowing, except when I play each song trough the file cabinet. The problem is that when I am exploring the photos and the memorabilia with music playing at the same time , the sound clicks and jump for 2 seconds every time I press the enter button on the remote control of the player for looking at the memorabilia, or at the photos. Not a tiny problem, because one the main reason of the project being released on Blu Ray , is that people can listen to music and exploring the memorabilia at the same time! Anyone having the same problem with Panasonic BD35 or other stand alone players? I just bought and hooked up a Panasonic DMP-BD60. I had the same skipping sound problem with navigating until I changed the Sound settings through the player. I chose "PCM" which disabled "bitstream". I also switched off "secondary audio". Not sure if your Panasonic has the same settings. This fixed the skipping for me. The BD60 seems great. Main down side for me is the lack of wifi connection. Apparently wifi enabled players are not yet available in Australia. I've hooked mine up via ethernet to my Airport wireless (Apple) base station. Downloaded the extra BDLive content without a problem. Sony, I wanna do an album withya..
We could do an album of reworked Neil songs. (with Thrasher's blessing of course! )I'm sure we could bring Shakeyspeare on board as well..We could call ourselves.. The 3 tenners... or "Thirty Quid"
"Stand and Delete..the Wrath of Thrash"
Well, I cut alot of my teeth on original Neil tunes, getting some chops. I send on the rewrites and rhymes out of pure sarcastic humor in support of this here site and all the strong work that goes along with it. I'm on board. "Everybody's sayin' that music's for FUN"
Thanks for the offer. When I make it to the land down under, I'll look you up. Ordered the BR archives last week (It will be my Fathers Day gift). I don't have a BR player, but bought a large Samsung LCD HD TV last December when my old rear projection TV died. The picture on the new "touch of color TV is spectacular, especialy compared to the old big screen. Holy s++t, as I am typing this a small box from Warner Brothers was delivered by the mailman! So now, I am also staring at the preview dis with no way to play it also! Anyway, after much investigation, yesterday I ordered the Panasonic DMP-BD60 player from Amazon for $250. Decided against the PS3, mainly because a new version (PS3 "Slim") is coming out in a few months. The Pan is BD-Live, Updatable firmware, and uses both USB and SD memory to store and transfer those sweet NY mp3 tunes, I hope. ....Father's Day in West Virginia! To JK from Australia a very heartfelt thank you. If I ever come to your country I owe you a lot of rounds of your favourite drink. I changed the settings on my Panasonic BD 35 as you said, and now everything is fine. PCM audio and Blu Ray rules! Hey Davide - that's great news. Glad your bluray player is up to the task now. Your welcome in Oz anytime - I was in Rome twice in the last year. I've been meaning to tell y'all this.When I was finally able to sit down and REALLY enjoy the preview disc.When all was said and done I swear to ya's at least about 3 hours had gone by.Albeit I did listen to a few songs more than once.But still. I'd have to say that's pretty SWEET! !Can you gimme an AMEN? !I knew ya could.Later gators. From the moment I live in Italy,if I buy Archives in USA or from Amazon,can I play on my Sony PS3 and on my TV?? ..or I must buy it in Europe? I know In usa use NTSC..no pal system. If I buy Archives in USA or Amazon,from the moment I live in Italy and here we use pal system,can I play Archives on my Sony PS£ and my tv??.. I know in USA they use NTSC system.